Reed canyon is under construction. Trees are being felled, dams built, and new areas flooded. These represent some of the most significant changes to the canyon since its restoration in the late ’90s, and they are the work of a masterful colony of engineers. Yes, we’re talking about beavers. 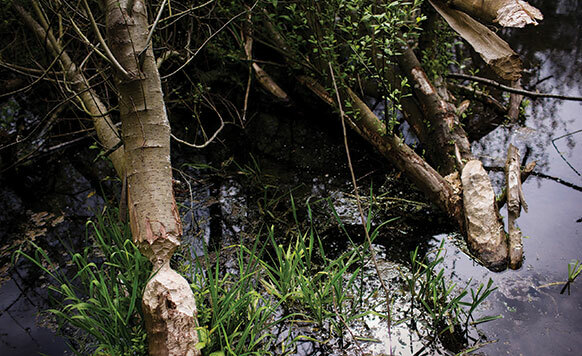 Like many other native species, beavers are increasingly returning to the canyon, drawn by Reed’s herculean efforts to restore the area to its native state. This spring, roughly a dozen of them have been demonstrating their species’ legendary industry. They have downed scores of trees to create a series of dams and ponds, slowing the flow of Reed Lake, and raising the water level by as much as six feet. Ironically, Perry has long wished for many of these changes, but was hamstrung by state and local regulations. The canyon is a designated wilderness area, intended as a haven for Oregon’s native ecosystems to thrive. But that designation also limits human meddling. For example, Perry cannot divert water from the lake, slow the creek down, or build dams without enduring lengthy state and federal permitting processes. Canyon crews of yore did not always take so kindly to the chiseling critters. For decades, Reed treated the canyon as a kind of glorified park. The lake was diked in 1929 to make space for the outdoor swimming pool, woody debris was burned because it was considered ugly, and bags of concrete served as stepping stones through the marsh shallows. 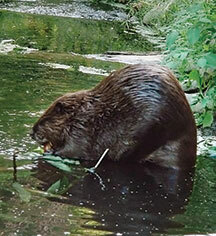 In those years beavers were seen as a menace. That began to change when Perry arrived in 1999 to lead Reed’s initiative to restore the canyon. Perry and his canyon crews have reintroduced scores of native plants, and their hard work has attracted several sentinel species, including otters, herons, steelhead trout, and coyotes. Maintaining wilderness in an urban setting is a never-ending task, however—so the crews welcome all the help they can get. 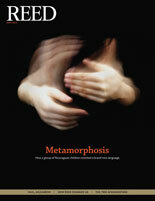 Make a gift to support the professors and future alumni who fuel the dialog in this magazine.